I started to title this blue jeans and t shirts since that is what you will normally find me in most days and the pillows I have added to the sun room remind me of those. Changing out my pillows seasonally or more is normal around here since I love pillows. It's one of the easiest ways to refresh a room. Come on in and you will see what I'm talking about. 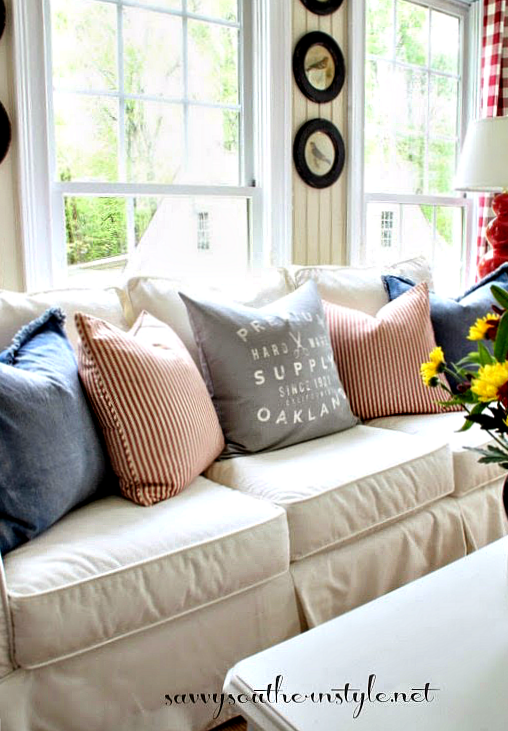 The denim pillows and the graphic one are very similar to what I would wear and spring is the perfect time for my sunroom to mimic what I wear. These new pillow covers are from H & M and are so darn reasonably priced. I remember Pottery Barn selling denim covers last year that were $69 each and the H & M ones are $17.95. The gray graphic cover is from there, too. As you can see I replaced the ironstone platters with these fun framed bird prints from Antique Farmhouse that I ordered a few weeks ago. I love the chippy black frames against my beadboard walls and birds certainly say spring. I have several live plants in here. The light is fantastic in this room with all these windows and they thrive in here. My old red ticking pillows work well with the denim and graphic ones and coordinate with the other red in the room. The top of this table was red last time I shared this room, but I recently painted over it. I'm on the lookout for an old wooden chest or trunk to use as a coffee table in here. I shared my new gray Pottery Barn floor sample chair on Friday. Lemons for a different pop of color. I have way too many magazines and I have already stopped two subscriptions. There's plenty of seating in here. I still love these kooboo chairs I bought at World Market several years ago. I added two large Pottery Barn gray linen pillows. View from the kooboo chair. Several days after I took most of these photos the flowers opened up. So this is my spring blue jeans and t shirts sun room. I love all your springy accents in this fabulous room, Kim!!! Such a happy place to hang-out. Beautiful, Kim! Love the graphic pillow and the denim ones are perfect in here for Spring and Summer! Have a great day. I just threw out 2 ivys that I killed:( Can you tell me how often you water them? Thanks!!! Pinky, I have killed them, too. My large bushy one keeps losing leaves. I stick my finger in and if it feels dry I water. That is what they say to do and they still die. The problem is probably spider mites killing your ivies. I have a hard time keeping an ivy alive also, but spraying them periodically with soapy water helps prolong them. Oh Kim I LOVE this room...love those pretty new birds prints too!! The pillows look great and I would want to hang out in this room to in my jeans and t-shirt! I love the other title!...I always am amazed on how you transform the sunroom for each season...the bird prints are wonderful and are perfect in the space!....good luck on your search for a trunk/chest. I am sure you will find the perfect one. I have so much to say about this room. I think it is my favorite in your house, but I really love your sitting room, too. I'm crazy about those World Market chairs and could kick myself for not buying some. Also love the bird prints, the touches of red, the new chair, etc. You are decorating perfection as far as I'm concerned. When can you come help me out? I have some problem areas that could use your touch. Oh, Janette you can decorate just fine, but if we were near each other I would certainly see if I could help. Thanks! Love your room and the new Pottery Barn chair. Looks great to me but my daughter is in LUV with the spring 2014 with all the red accents so she wont be happy , lol. Love this room, always so pretty. Love that room, and it looks so cozy:D That red striped chair is lovely. I found some material the other day that looks just like that, but the background is a little darker (almost like burlap). I think I might have to keep looking because that's just beautiful! Kim, it looks beautiful. I love all the changes, but I also loved it before. No matter what you do or what you change it looks amazing and gorgeous!! Love the new bird prints too. Everything in this room is absolutely perfect! Oh I love all of the touched you have made to bring spring into your sun room. I want a sun room so badly! One of my favorite childhood memories is the lovely home of my aunt and the sun room in her home. this is such a wonderful space, I LOVE this room! So great that you can change things up so easily for each new season. love the round bird prints! I love t-shirts and jeans as well Kim. Your sunroom looks so inviting in any season. Love the framed bird prints and graphic pillow. Kim, I love the spring-into-summer additions to your sunroom. The denim pillows add the perfect touch; and the bird pictures bring nature indoors and are so pretty. I can just imagine you and Miss Bailey sitting here in the sunshine. I live in denim, too (and I also keep magnifying glasses on my coffee table--I use a large one to accurately judge Z's insulin dosage). Have a great week. Your sun room has always been one of my most favorite rooms in your house, and this post just makes it more so! I adore all your changes in the sunroom, Kim!!! Your pillows.... SIGH!!! Thanks for the lead to get reasonable pillows!!!! Such a cozy space Kim, love all those pillows! Love the changes. I need to check our some new pillows myself. I have always loved every single thing you have done in that room! Such a perfect place to celebrate spring! Looks lovely and ready for spring. It's all gorgeous, so well dressed in its pretty spring attire!! I especially love the all the staples that you have year round, but am in love with the vase of beautiful spring flowers - the perfect accessory for your sun room's seasonal outfit! It's so fun to come and see all the changes you've given this beautiful room, Kim! Love the pillows, the bird prints and the new and old chairs! It's always so pretty! Looooove it all Kim. Everything in this sweet room is always so fresh and cozy. I would spend so much time out there. Really pretty. Your room is beautiful! Lots of color, light and comfort. I know you enjoy this space so much-- thank you for sharing. I have a question ~ The white table with the red ticking stripes ~ did you paint it and what kind of paint did you use. Could you share your source for the red buffalo check drapes? They just make the room! I LOVE your sun room. It's so pretty! I also LOVE the bird prints and went to the site, but they aren't on there. I guess they sold out. They would look so nice in my dining room. Susan, Antique Farmhouse and Decor Steals is a daily steals site where the products are available for a short time and a lot of it sales out very quickly. Be sure to sign up for their daily newsletter that will come in your inbox to alert you each morning for the new sales. These will be back again I'm sure. Can I come over and just hang out in your sunroom? Out of all your rooms in your home this one is my favorite...its happy! This room seems so comfortable. The bird prints are so nice. Oh, Kim, I always love to see what you do in this room, but this may be my favorite look yet! Love the way you combine elements--some are casual, some are elegant, but together everything just works! Somehow you make it all look effortlessly put together. I'm guessing you put a good deal of effort into achieving that look! Just like the rest of your home, this room says "Welcome." Thank you for always sharing your great ideas with us! Kim Your Spring sun room looks amazing!!! I love the cozy feeling your room has! Kim, everything looks so beautiful! I love the mix of textures and colors in this room. It looks so inviting and relaxing and fresh! A wonderful place to read a book, relax and enjoy the sunshine! Kim, I love your charming decor, the colors just pop! Those red buffalo drapes are to die for! I'm so crazy about your white pitcher with the yellow flowers, nothing as cute as flowers in a pitcher! I always enjoy your posts, always wonderful! Kim, your sun room is so light and bright and pretty! I especially love the touches of red and the bead board on the walls and ceiling. I love that you can change up your pillows for a different look. I've always found this difficult to do in my sitting room, it's a different look I guess. Love those bird frames, they look so pretty either side of the window and with that great flea market sign. Nothing kicks up a space like a touch of red! Yours is just fabulous !